I had never heard of a MoonTubeShot. Props to @NomadWarMachine for making it a Daily Create. It’s a cool effect, and I especially like the low-tech angle. I think a moon needs context though. 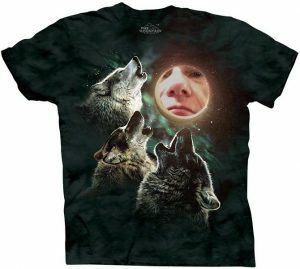 And what better than the three wolf moon t-shirt? So I did a search for an image of the shirt, and just happened to find one that was uploaded to flickr by snakepliskens before he escaped from the USA. I used the elliptical marquee tool in Photoshop to select the moon and then filled it with black. The I copied my MoonTubeShot and pasted it on top and changed the blending mode to lighten, and moved it into place. I didn’t even have to scale it. It was a little too bright, so I lowered the opacity a little. In hindsight, I should have done something about the color cast to make it blend better, but hey, it works well enough. 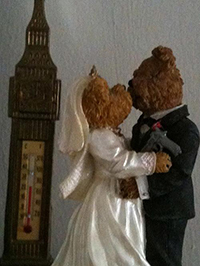 This entry was posted in Uncategorized and tagged dailycreate, ds106, threewolfmoon. Bookmark the permalink.